At High&Dry, we believe in getting the maximum life out of computers by running ’em off of Linux after their stock OSs have left them behind. 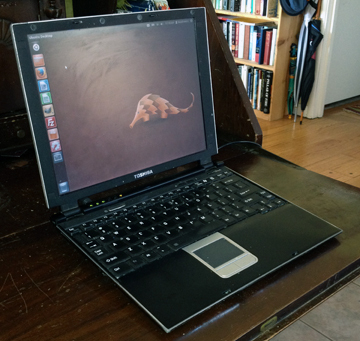 Case in point: The Toshiba Portege r100. The r100 is a sweet ultraportable that shipped with Windows. My wife got one in around 2008 and it went strong for a few years and then its hard drive fried. I got a new drive, a 40GB dealie exactly like the original, but we didn’t have the installation CD; either it didn’t come with one, or we lost it. Microsoft didn’t support the version of Windows that came on it anymore, and Toshiba didn’t have replacement discs. After repeatedly going to a page on the Toshiba website that said something like “Replacement discs are temporarily unavailable, check back soon,” a Toshiba rep said they’re just not made anymore. So the r100 would be scrapped for parts, or I could try installing Linux on it. But this thing has very limited options: It can only boot from hard disk or over PCMCIA. So I got a USB enclosure for $15 or so and mounted the drive on my Mac to install Linux, after booting my Mac into Linux running off a CD. Before I did anything, though, I added a 1GB RAM module to the Toshiba, so it had the max RAM of 1.25GB. The distribution I chose was Ubuntu 12.04, and it works like a charm. I made a few dumb mistakes along the way though, despite some great resources that are out there on the Web, so I’ll spare you the drama of all my mishaps, and recount the important parts of what worked, as if I had no problems. During the install there’s a screen that says something like “Do you want to replace OS X with Ubuntu, Run OS X alongside Ubuntu, or Something Else,” I chose “Something Else,” since I wanted to install Ubuntu on an external drive that was destined to be an internal drive of another computer. On the next screen, Installation Type, I saw both my Mac’s drive and the Toshiba’s drive. If you’re doing what I’m doing, and you don’t see both, don’t go any further, because you’ll be mucking up your “host machine,” which in my case is a Mac. Here, I designated 38GB as an ext3 partition with a “/” mount point, and the remaining 2GB as swap area. You can go forward without a swap area (though you’ll be advised not to), but you can’t go forward without a mount point. Ext3 or ext4 are required for Linux, but other formats might work as well. For the Device for Boot Loader Installation, I chose the one that has the name of the hard drive in it, rather than the 38GB partition I created. The first time I did this, I chose the one with the 38GB partition, and when I tried booting from it, the Toshiba told me “No can do,” or words to that effect. Also, don’t choose your host computer’s hard drive, obviously. Next, making damn sure that the 38GB partition was selected in the main window (as opposed to the Boot Loader area), I clicked Install and followed the prompts around setting up my preferences. I chose to log in automatically; it just seemed like it would avoid future problems. After putting the newly Ubuntufied hard drive back into the r100, I connected the r100 to my router with an Ethernet cable and booted into recovery mode (by choosing that option on boot), so that I could install the correct video driver. It’s possible that it didn’t have the correct driver because I installed Ubuntu onto the hard drive from a Mac; at one point during the install I saw messages to the effect that it was “detecting” and “configuring” hardware. After it finished booting into recovery mode, I choose “Enable Networking” from the list of options, and a message at the top of the screen confirmed that the system was now in Read/Write mode. Then I just said “sudo reboot,” took out the Ethernet cable, and watched ‘er boot. One pretty gnarly issue I encountered was that the machine slept so hard when it went into suspend that I had to reboot the dang thing. This is really bad problem if you have unsaved work, step away to answer a phone, and your 3-year old (or someone like him) comes over and slams the lid shut. This happened whether I issued the Suspend command from the menu or by closing the lid. This is what worked for me, If this helps anyone. First, I created a “custom quirks file,” and I have to confess that I don’t know that is; I was just following the instructions of the very helpful Toz responding to my post on the Ubuntu forums. And that did the trick. You can read the whole post here for more info. For example I had to try several “quirks” to get this to work, and another might work better for you. If you follow that post all the way through you’ll see that initially I tried uswusp, additional software for handling suspend behavior, but ended up scrapping it. Ubuntu gave our family two more years of life out of this sweet little computer. It has terrible battery life, but it works well as a humble kitchen computer, and plays well with all our peripherals, even our old scanner, which won’t play with anything else. After reinstalling on the new hard drive, I started to get strange updates that I couldn’t even run. I realized that that was probably because I was starting with a very old version of Ubuntu, 12.04.2, and so I installed 12.04.5 instead. To get the latest kernel, which only works with PAE-enabled processors, I used a nifty trick called fake PAE. This worked fine except this time around, when I installed the trident driver, I was told something along the lines of “That’s great, done, but we’re going to set you up with the latest/greatest trident driver instead.” Sounded good, but unfortunately that didn’t work for me, so I had to remove the updated driver before I could go back to the original driver I was using, which works like a charm. Now it’s happily running, and fully up-to-date, and I fully expect the hard drive to fail in another two years, as did the first two. But at that point, Ubuntu 12.04 will have run out of its support period, and we will have gotten a pretty decent bit of life out of this box.